Arjun Kapoor, who was busy shooting for Namaste England, took a break from his schedule and hosted a mini get-together for his family. The sudden demise of Sridevi has brought the Kapoor clan together specially, Arjun and his two step-sisters. Arjun, like a doting son, stood thick and thin by Boney Kapoor and supported him during the emotional crisis. The Mubarakaran actor was present with his father in Dubai to ensure all procedures were completed and they could bring Sridevi’s mortal remains back to India. 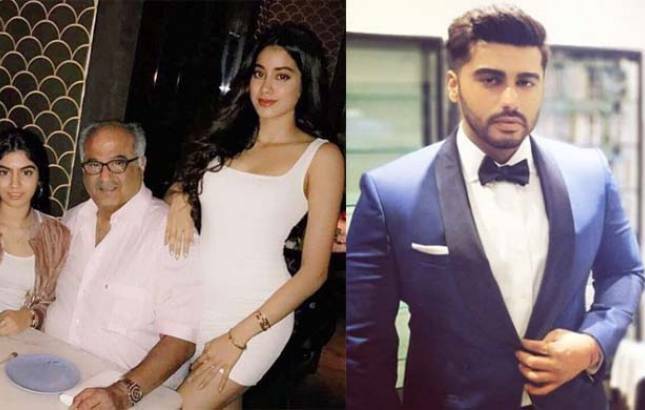 Boney Kapoor on Friday paid a visit to Arjun at his Mumbai residence with his two daughters Janhvi and Khushi Kapoor. The newly married couple Mohit Marwah and Antra Motiwala were also spotted at Arjun’s place. Arjun Kapoor, who was busy shooting for Namaste England, took a break from his schedule and hosted a mini-together for his family. The Gunday actor has requested Vipul Shah (producer of Namaste England) to give him a break of seven days after Sridevi’s death, as per a report in BollywoodLife. “Arjun had to take leave for about 7 days to be beside his dad and family. He had to ensure everyone was doing okay. Arjun knew that the entire production crew was waiting in Punjab for him and he had to finish off a week’s backlog as soon as he hits the sets. He spoke to Vipul and informed him that he will be doing 18-hour shifts to make up for lost time!” The actor is now back to acting and is fulfilling his commitments to his films. He is also making sure he spends enough time with his family," a source was quoted as saying to BollywoodLife. The Kapoor sisters also recently got together to make Janhvi’s birthday special for her. Sonam Kapoor along with Rhea, Anshula and Khushi shared some light moments in the low-key birthday dinner. Both Arjun and Janhvi are gearing up for the release of their upcoming films. Sridevi’s eldest daughter, who recently turned 21, will make her Bollywood debut with Dhadak. The Shashank Khaitan directorial, which also stars Ishaan Khatter is expected to hit the silver screens on July 20. Arjun Kapoor has two big films lined up in the form of Namaste England and Sandeep Aur Pinky Faraar.